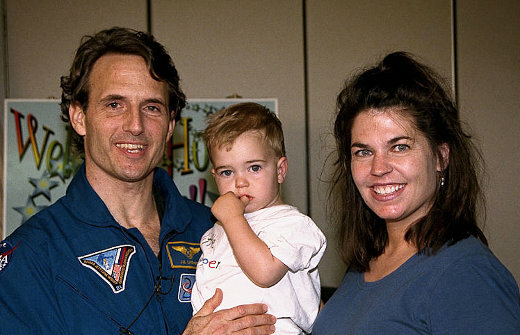 On January 12th of 1997, 41-year-old astronaut Jerry Linenger kissed his pregnant wife and 14-month-old son goodbye, boarded Space Shuttle Atlantis, and headed for Space Station Mir where he joined two Russian cosmonauts. He then remained in Space for a record-breaking 132 days. Below are just three of the dozens of letters he wrote to his young son, John, during his stay. Jerry returned safely to Earth on May 24th. His wife gave birth to their second son a few months later. I decided before this flight that I was going to be a good father and write to you every day. This is my first attempt at that. I realize that you are only one year old, and although I exaggerate your talents like any proud father would, I don't think that you can quite read this yet. No problem. When you can, you will feel good knowing that your father loves you. Space flight is a dangerous business. I used to be pretty cavalier about it. But just before this launch, I started questioning what I was about to do. You see, I have so, so much to lose now. You and your mother. I always liked adventures. I remember exhausting the elementary school library of mystery books by someone I think was named Orton. Trying to figure out the ending before the ending. Anticipating. Observing the happenings and trying to predict the outcome. Reading about people who found themselves in unusual and challenging situations, and then seeing how they responded. Anyway, that curiosity characteristic is what got me on this space station. Oh sure, I went to lots of schools and did pretty well in our great U.S. Navy. In order to become an astronaut, I went through all the mechanics of the application and interview process. But the basic trait of insatiable curiosity is what drove me through all of that. Space is a frontier. And I am out here exploring. For five months! What a privilege! But, I sure do miss you. I want most of all to see you come stumbling around the corner, bellow out your big laugh when I give my "surprised to see you" look, and then watch you stumble back out of the room to repeat the same to Mommy in the other room. You are the best son in the world, John. You know, although I am up here floating above Earth, I am still an Earthling. I feel the pain of separation, the pride of a father, and the loneliness of a husband away from his wife like an Earthling. And maybe even a bit more acutely. Good night, my son. I'll be watching over you. People often ask me what I miss. You and Mommy, of course. Likewise, family and friends. But I also miss fresh air blowing in my face. Green, green grass and swaying trees. Birds chirping. Tulips popping up in spring. Taking hot showers. Lying on the couch. Falling asleep with two big pillows surrounding my head. Diving into the swimming pool after a long, hot run. Tinkering in the garden. Looking out over the lake as the sun sets. Feeling the warmth of the sun. Gliding across the water in a kayak with fish jumping in my wake. Pretzels. The smell of popcorn, or better yet, homemade bread baking. Dinner conversations with Mommy. Cuddling. Silent nights. Crickets. Waves pounding on the shore. Walking barefoot in the sand. Walking. Holding hands. Basically, I miss the elemental things of Earth that we are blessed with each day on the planet but often take for granted. After I land, my eyes will be opened as wide as yours always are, John, as I rediscover the little pleasures. Father and son, holding hands and out adventuring together. Rest up. We will be busy together. Good night. I have changed post offices. This letter is being sent down from the space shuttle Atlantis, and in a day or so I will be home. We closed the hatch last night between the Mir space station and the shuttle in order to be prepared for our early-morning departure. Following a gentle push-off, we began intermittently firing our thrusters. The bursts made loud bang-bang-bang sounds, similar in abruptness to cannon firing. As we moved away, the Mir became smaller, then smaller still. Finally, it was so diminished in size that the space station appeared to be nothing more that a rather insignificant blinking light among the stars. Surprisingly, I felt very little emotion when leaving my home of the last one hundred and twenty-two days behind. I suppose that I just felt like my time was up, that I had done my duty, and that it was time for me to go. This is in stark contrast to the very strong emotion that I felt upon first seeing the space shuttle Atlantis arrive a few days ago. When I saw Atlantis approaching the Mir, I felt pure elation, pure unbridled joy. I have an image in my mind of the time you took your first steps. I would move two steps away from you, leaving you standing and holding on, precariously, to the edge of the sofa. You would look at me with questioning eyes. Your eyes reflected what I am sure that you were asking yourself: "Can I do this, or will I fall?" After I would encourage you with a reassuring word or gesture, you would muster up your courage, let go, and walk to me. Reporters keep asking me whether, after landing, I plan to get out of Atlantis on my own power or be carried off. I will be trying my best to follow in your footsteps, John. I will be giving it everything that I have to walk, or crawl, or do whatever it takes, but to do it on my own, just like you did. I hope to be standing and holding you in a day or two, John.